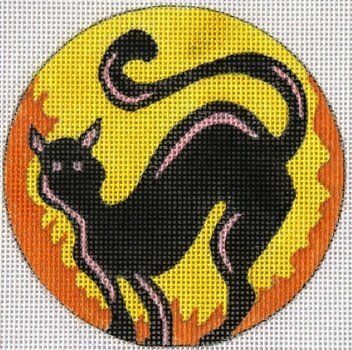 Black Cat Halloween needlepoint design is handpainted onto 18 or 13 mesh Mono Zweigart needlepoint canvas. The design area measures 4" diameter. 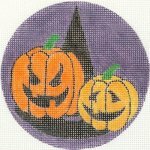 This JulieMar needlepoint design is sold canvas-only or with fibers, We provide DMC embroidery floss for either size mesh if you select cotton. If you choose Silk we use Pepperpot Silk by Planet Earth which is also single ply for 18 mesh; Planet Earth silk for 13 mesh.